Love and Lust London was set up to take the capital’s singles scene back to basics. Gone are the ringing bells, two-minute speed date timers and awkward shifting of stools, replaced instead by a dance floor filled with single, like-minded people. The best news? This fresh approach to dating is housed here at Beaufort House Chelsea, one of London’s most exclusive private members clubs, and guests are treated to some of the most current and up and coming DJ’s the city has to offer. Founders Julie Cockram and Victoria Sandford bring with them a wealth of experience in luxury events and lifestyle management. The duo met working for one of the world’s leading Lifestyle Management companies with a client list that includes Coutts, Citibank and Vertu. Having always had ambitions to set up their own company and following personal experience of London’s uninspiring dating scene, they set about creating a freshly branded event that would take the awkwardness and cheesiness out of dating. 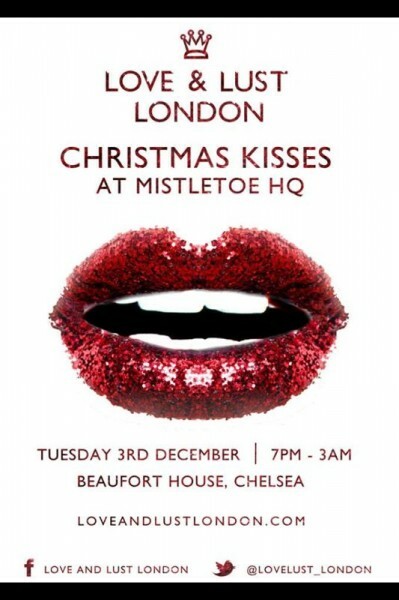 So kick off the start of the festive season in style with us and see how many kisses (numbers or dates) you can collect at Mistletoe HQ!